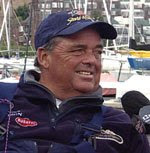 Dennis Connor’s 60 foot yacht hits whale and sinks in the Pacific Ocean during the Newport to Cabo race. 21:00 hours - US Coast Guard received mayday from Stars & Stripes that they had hit a whale and have been taking on water at a rate that was not able to stop. Their last known position placed them 40 miles south west of the Mexican island of Coronado. The crew had radioed that they were abandoning ship. The coast guard cutter Pt. Loma has been redirected to their GPS coordinates. On arrival, Admiral Overthetop reported that they had come upon a large island of floating empty Mount Gay rum bottles that surrounded the life raft. All crew seem to be dehydrated and a bit tipsy. The crew is on route to San Diego, CA for more debriefing on what happened.